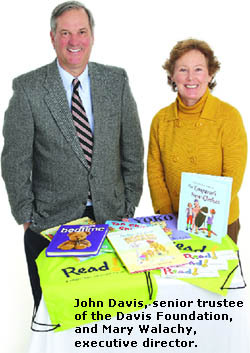 John Davis, senior trustee of the Davis Foundation, and Mary Walachy, executive director. That was the phrase she chose to describe Irene E. Davis’s approach to giving back to the community — at the least the model she used for most of her life. An orphan for much of her childhood, Irene — who married George A. Davis, first a salesman for American Saw & Mfg. and then owner of that company — was, later in her life, very generous when it came to donating money to groups that would help those less-fortunate, especially children, said Walachy, executive director of the foundation that bears the Davis name. However, there was little, if any, structure or organization to her giving, she continued, noting that donations were often in cash and given at the spur of the moment. To illustrate the way in which Irene was “personally philanthropic,” Walachy relayed a story from around 1970 that she’d heard many times, knew she couldn’t retell as well as Davis family members, but tried anyway. It seems that Irene Davis had become impressed with the work of Downey Side (the adoption agency that was started in Springfield and now has offices across the country), and stopped by the offices of its founder, Father Paul Engel, to find out more. After listening to him for some time, she got out her checkbook and wrote him a check — for $30,000. “But he didn’t even look at it to see how much it was for,” Walachy explained, noting that Engel was being polite, but also didn’t know Davis and wasn’t at all sure of who was dealing with. “He just put in his desk drawer. When he took it out later, he was shocked; he thought, ‘this is a crazy lady,’ or ‘she doesn’t know what she’s doing … this is going to bounce.’ He didn’t even take it to the bank. It wasn’t long after this episode, according to family lore, that Irene Davis’s son, Jim, recommended that she form a foundation to bring some order to her philanthropy, to keep records of which groups were sent money and to perhaps monitor whether money was spent in the manner intended, said Walachy. At first, she refused, thinking such a step was mostly about taxes and gaining deductions, which she wasn’t interested in. But when Jim told her it was a way for her to keep on giving to the community long after she passed on, she eventually agreed. And so the Irene E. and George A. Davis Foundation was born, with an initial $350, and for 40 years, its giving has been anything but extemporaneous — although it can act swiftly and with great flexibility, said Walachy, adding, quickly and repeatedly, that this institution exists to do much more than simply award grants, or give. Instead, she told BusinessWest, the foundation also initiates, convenes, unifies, collaborates, finds facts, analyzes, tests, evaluates, advocates, and more. And what it’s really doing through the sum of all this is “causing change,” she continued, especially in the broad realm of early-childhood education and development. “The majority of our time and attention is absolutely local,” she explained, “and with a significant lens in education and particularly the passion around ensuring that children, especially those in the urban core who are disadvantaged, reach their full academic potential in order to be successful in both school and in life. This focus on education, young people, and causing change, as she put it, is part of what Walachy called a “maturation” of the Davis Foundation — something that has dominated her time with the organization, which started in 1996, and which is still very much ongoing. And it’s part of her efforts to adopt best practices involving many of the leading foundations in the country, and also be far more proactive than reactive when it comes to philanthropy. However, the foundation understands that resources are limited in Western Mass., and that there are simply not as many charitable foundations here as there are in Boston, she went on, adding that funds are also awarded to groups that assist the elderly, the mentally challenged, and many other constituencies. But, again, she said that giving money is only a part of the equation. In recent years, a perhaps-bigger part is that ability to convene, which is part of the maturation process, and something made possible because the Davis Foundation supports so many nonprofit groups. Walachy noted that, while one can see the Davis name on a few plaques or walls across the region — the Neonatal Intensive Care Unit at Baystate Children’s Hospital is one example — this family isn’t big on having things named after it. Rather, the real incentive comes in getting a chance to be impactful, to cause change, which is how it chooses to serve the region and carry on the work of Irene and George Davis. The family’s methods of philanthropy have changed considerably since Irene’s cash gifts and random check-writing. But the impact is still the same. The foundation is still making for the best days in many nonprofit administrators’ careers, and creating innumerable poignant moments in their lives. As he uttered that word, he paused for a second, as if to convey that maybe it was too strong a term, but then forged ahead, convinced that it wasn’t. 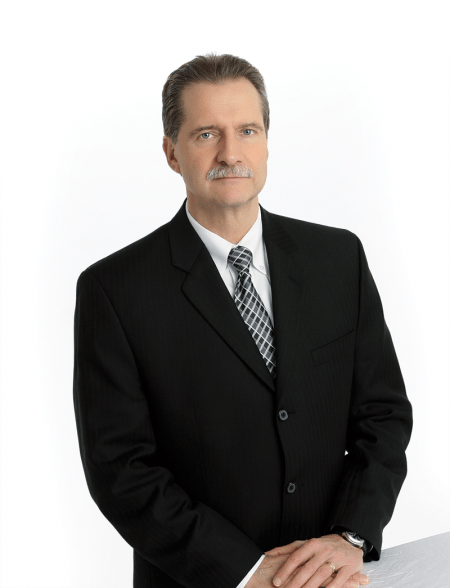 In many respects, Goodwin’s work as president and CEO of the Springfield-based Center for Human Development (CHD) boils down to changing those perceptions he described. And it is because of his success in convincing others that programs in areas ranging from disability resources to the mentoring of young people; from homelessness prevention to post-incarceration services, are, in fact, investments in the community, Goodwin — and, ostensibly, the 1,300-member team he manages — is a member of the Difference Makers Class of 2010. • Social Enterprises, which are entrepreneurial programs, such as A New Leaf flower shop and Riverbend Furniture, that offer real jobs to people with mental illness, developmental disabilities, or histories of trauma, abuse, or addiction that often keep them from working in traditional settings. Summing up all of this work within CHD, the largest nonprofit, multi-program human services agency in New England, in a few moments or a few sentences is quite difficult, so Goodwin talked generally about the sum of the dozens of specific programs within the organization. This is accomplished — again, in broad terms — by creating what Goodwin described as “hybrid services” a term he would use repeatedly as he talked with BusinessWest, because it is the cornerstone of CDH’s basic operating philosophy. And by hybrid, he means a combination of clinical and social services. • Overall, he’s developed an extensive system of creative client businesses that produce high-quality products, teach vocational skills, and provide jobs to hundreds of clients in a rehabilitative atmosphere. 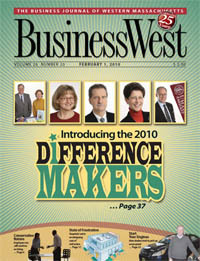 But he told BusinessWest that what he considers his greatest accomplishments are building CHD into one of the region’s largest, and best, employers — one with a 95% retention rate among management-position holders, a remarkable number in the human-services industry — and ongoing work to take that word ‘drain’ out of the lexicon when it comes to work his team does. And the workplace element is vitally important to the equation, he explained, returning, again, to that notion of teamwork. As an example of the work CHD does, how it does it, and why this work is so challenging — and frustrating from a funding perspective — Goodwin pointed to an initiative called PACT, or the Program for Assertive Community Treatment. Unfortunately, this is a program for which the state recently cut funding. “That’s a program that basically serves people in Springfield and Holyoke who are severely mentally ill and have had tremendous difficulties,” he said. “They’ve been hospitalized many times, incarcerated, that sort of thing, and have been a real strain on the community. That’s another way of saying that that this organization — and its long-time CEO — are true Difference Makers. Their contributions to the community vary, from work to transform elder care to donations of time, energy, and imagination to a host of nonprofit agencies; from philanthropy that far exceeds grant awards to work to improve the lives of some of the most downtrodden constituencies in our society; from multi-faceted efforts to spur economic development in the region to simply inspiring others to find ways to make an impact. They are the Difference Makers Class of 2010. Their stories are powerful  and compelling. Shareholder with Shatz,Schwartz and Fentin, P.C. Shareholder with Shatz, Schwartz and Fentin, P.C. Ellen Freyman was talking about her family’s work mentoring and tutoring members of a Somali family now residing in Springfield through the help of Jewish Family Services. She spoke proudly of the time and effort that she, her husband, Richard, and sons Neal and Stephen were putting into this initiative, and said she firmly believed they were improving the quality of life for this family of five. But she also conveyed a strong sense of frustration and concern that speaks loudly about how she approaches her voluminous work within the community and explains why she’s a member of the Difference Makers Class of 2010. Freyman first met with Springfield teachers and principals, and later with Superintendent Alan Ingram, to discuss the problems facing not only ‘her’ Somali family, but others, as well as young people speaking other languages who are seemingly thrust into classes in the city’s high schools where other students are reading Hamlet and Of Mice and Men. As a result, a task force has been created to assess the problem and recommend possible solutions. But that group’s work probably won’t happen soon enough to help of the oldest of the children in the family the Freymans are working with. He’s now 19 (at least that’s the best guess), and he will need literacy skills if he is to get a job. Unfortunately, the waiting lists for adult-literacy programs in the area are so long that some people don’t even bother trying to apply. So Freyman, in addition to her one hour a week of mentoring and involvement with that aforementioned task force, is working to find a solution to the literacy-class problem. Being creative and thinking outside the box is how Freyman, a principal with the Springfield-based law firm Shatz Schwartz and Fentin, P.C., goes about her work with a long list of organizations, ranging from the Dunbar Community Center to the Community Music School; from the Springfield Jewish Federation to the Springfield Technical Community College Foundation. Her bio on the law firm’s Web site lists more than a dozen nonprofits and initiatives to which Freyman has lent her name and time. But that’s just part of the story. The energy, imagination, and outside-the-box thinking that she takes to not only these assignments, but projects she’s initiated, are other big parts. For example, there’s her work to create a group called On Board Inc., which works with area boards to help them achieve not only diversity, but also cultural sensitivity. It all started in the early ’90s, or not long after Freyman began her work within the Greater Springfield community with such groups as Jewish Family Services, the Springfield Library & Museums, StageWest, and others. So she collaborated with a few other women to create a name bank of sorts with such qualified women, and then approached banks, hospitals, and other organizations to use that resource when filling seats. “We met with various board representatives and nominating committees, and said, ‘we know you want your board to be more diversified, but you just don’t know how to do it, and you don’t know who’s out there.’ We met with college presidents, hospital CEOs, and banks, and within a year we had great success; we had a lot of women on these boards. The work with On Board Inc. exemplifies the approach Freyman says she takes with her work in the community — to look beyond her own basic assignment (attending a meeting or two a month) and to look for ways to, well, make a real difference. Returning to her work with the Somalis, for example, she said she’s working together with others to create a soccer team that will compete against other clubs in the region; she’s agreed to be its manager. With an assist from Go FIT founder (and 2009 Difference Maker) Susan Jaye-Kaplan, with whom she runs most mornings, Freyman was able to secure 36 new pairs of cleats from Boston-based Good Sports Inc. She’s also received donations of soccer balls, but she’s looking for help with arranging contests and getting the Somalis to games and practices, either through rides or donations of bicycles. In other words, she’s looking for more people willing to think — and work — outside the box. Upon hearing that more than a few of the many people who nominated her for the Difference Makers Class of 2010 wrote that she “transformed care for older adults,” Carol Katz chuckled before saying that she found such language flattering, if also a little excessive. 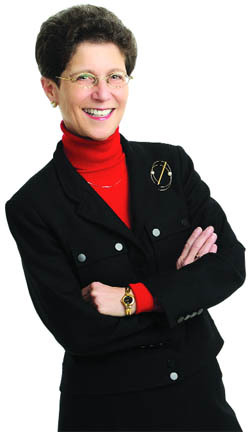 “I would hardly call myself transformational, but that is a term that’s used in our industry in some ways,” said Katz, CEO of the South Hadley-based Loomis Communities, before quickly acknowledging that she obviously played a lead role in that organization’s drive to stay atop — and well above — the curve when it comes to adopting the more-patient-centered model of care now being embraced across the country (more on that shortly). Elaborating on the patient-centered model, Katz said that, as the name suggests, it puts the patient at the center of care initiatives. As logical as that sounds, she told BusinessWest, until about a decade ago, the staff at long-term-care facilities such as nursing homes was in the center, in the so-called ‘patient-care’ model. “Traditionally, care has been provided in a very institutional way, and nursing homes in particular, like hospitals, are staff-driven, with things done for the convenience of the institution and as far from home life as it can possibly be,” she explained. “There’s been a movement afoot for some years now, in nursing homes but also other facilities, to really change the culture to what they call person-centered care. As a result of the teamwork Katz mentioned, Loomis Communities became one of the first institutions of its kind to receive state grants to implement this new way of providing care, and Loomis House was just the second nursing home in North America to receive person-centered-care accreditation. But these transformational efforts comprise just one of the realms for which Katz has been called a Difference Maker. Others include her work to expand the Loomis Communities, her service to innumerable nonprofits in the area, and her ongoing efforts to create a culture of giving back at all of the Loomis facilities. When she arrived in 1989 after stints with skilled-nursing facilities in Wisconsin and Agawam, Loomis had one facility — Loomis House in Holyoke — with a second, Loomis Village, under construction. Recognizing the need to continually expand to better meet its mission, but also understanding that new construction wasn’t (and still isn’t) needed because of demand levels, Loomis has grown through acquisition. The first such move was Applewood in Amherst, and the second was Reed’s Landing in Springfield, the bankrupt facility that was acquired late last summer. There, Katz has led a change in the fee model that has put that facility within reach of far more area residents. 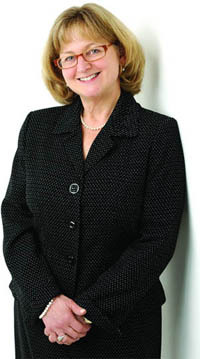 While expanding Loomis Communities and changing its model of care, Katz has also volunteered her time, energy, and expertise to organizations ranging from the Holyoke Chamber of Commerce to PeoplesBank; from Westfield State College to her synagogue; from the United Way to the Holyoke Rotary Club. And she has made giving back to the community part of the culture of life at all of the Loomis communities. Indeed, residents have contributed to a number of causes and charitable events. For example, they have sold decorative Valentine’s Day cookies to benefit the American Heart Assoc. ; sold daffodils and participated in the Relay for Life for the American Cancer Society; walked, raised money, and sold more than 183 dozen blueberry muffins to benefit the Alzheimer’s Assoc. Memory Walk; staged blood drives for Cooley Dickinson Hospital, Mercy Medical Center, and the American Red Cross; sold Brightside Angels at the Holyoke Mall; and wrapped gifts for the hospice program of the Holyoke Visiting Nurse Assoc. “Our five-year strategic plan has five focus areas, and the first one is community integration, and that means both having events on our campuses that bring the public in and engaging our residents in the broader community,” she said, noting that many residents in each Loomis facility are from the community in question. “Just because you move from an address in South Hadley to Loomis Village doesn’t mean you stop being a citizen of South Hadley.